We all know that bananas and berries create particularly yummy smoothies, after all strawberry and blueberry banana smoothies are famously popular. 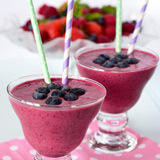 So, I thought, why not create banana berry smoothie recipes using a variety of mixed berries. The berries add the sweetness and the bananas the creaminess – a marriage made in heaven. You can experiment with lots of different flavour combinations. Ready frozen bags of mixed berries, which usually contain strawberries, blackberries, blueberries and raspberries, make it very easy. Use this as a base then just add whatever else you fancy to add more sweetness or creaminess to your smoothie. Remember, strawberries and raspberries are very sweet, so adding extra will give you that sweetness without the need for sugar or honey. You can go the traditional route and add yogurt for added creaminess, or you can make it dairy free by adding fruit juice, such as apple juice. Place the frozen berries into the blender first. Add the hulled and sliced strawberries next, along with the banana, yogurt and almond milk. 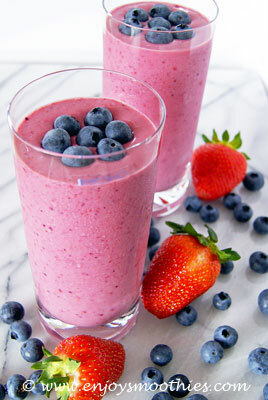 Start the blender on low, then turn up to high and blend until your smoothie is thick and creamy. 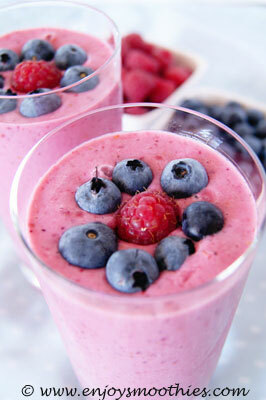 Place the frozen mixed berries and raspberries into the bottom of the blender. Hull and slice the strawberries and add to the berries. Add the banana, yogurt and almond milk. Start the blender on low until the berries are mashed, then turn the blender up to high and blender until thick and creamy. Then taste test. If you prefer your smoothies a little more sweet, add the honey and blend again. 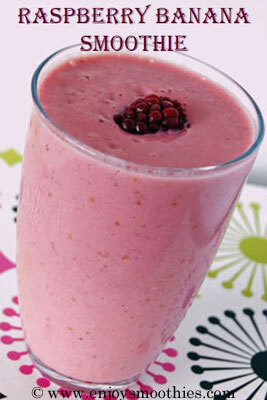 Place frozen raspberries, banana, yogurt and apple juice into a blender and blend until thick and creamy. Start with ½ cup of apple juice. If you find your smoothie is too thick simply add a little more apple juice and blend until you have reached the desired consistency.